Our generation is the first to experience an artistic renaissance catalyzed by access to the web while creating. We can find inspiration in philosophy, literature, poetry, plays, films, documentaries, interviews, music, lectures, tutorials -- worldwide, at no cost, anytime -- while working in any medium. Whether painting outdoors or animating at a desk we have access to ideas and inspiration unmatched by any previous generation. Enjoy being conversant in the Grand Ideas via our generation's Web Renaissance! 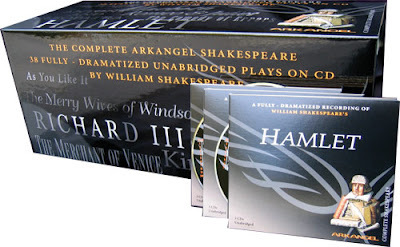 The Complete Arkangel Shakespeare audio book -- a multimillion dollar production five years in the making using over 350 actors -- is the definitive audio Shakespeare. Someone should buy the copyright for this entire project and release it publicly. In the meantime check out your local public library.